The “Deserts” portion of this Deserts and Inland Empire vacation and travel guide provides information about Death Valley National Park, the Mojave Desert (including Joshua Tree National Park) and Anza-Borrego Desert State Park (which is also covered in the San Diego section of the guide since it traverses both areas). 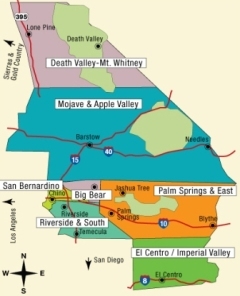 The “Inland Empire” refers to Riverside and San Bernardino Counties (about 40 miles inland from the Orange County coast) and includes information about Coachella Valley destinations (Palm Springs, Palm Desert and Rancho Mirage), the Temecula Valley’s wine region and the mountain tourist retreats and getaways in Big Bear, Lake Arrowhead and Idyllwild. Interestingly, what’s considered “high season” for these two areas is largely the same but for entirely different reasons. While the winter is the most comfortable season in the desert (contrasted to July and August when temperatures can reach 115 degrees Fahrenheit), the mountains come alive with snow skiing/boarding during this season. It’s not unusual to be floating in a Palm Springs pool and gazing at snow-covered mountains nor is it out of the question to begin your day at the beach in Orange County and spend the afternoon skiing on Big Bear. From the 1930s through the 1970s, Palm Springs was known as the “Playground of the Stars” because so many Hollywood celebrities owned homes there. While the area remains a popular retreat for the rich and famous, it is now a playground for retirees, conventioneers and travelers of all means. In addition to a stunning collection of mid-century modern architecture, it boasts a lovely art museum and hosts many festivals throughout the year, including an International Film Festival, Fashion Week, multiple food festivals and several gay-lesbian events. There is an abundance of wonderful spas, casinos, golf courses, stores and restaurants just waiting to cater to your every whim. The Inland Empire’s mountains have served as a retreat for many years and were first used by the area’s indigenous Native Americans as a respite from the valley heat and a reliable source of food. In later years, the area’s forests were harvested and were used to build much of Los Angeles, and a dam was built to supply water and power to the San Bernardino Valley orange growers. Presently, the San Bernardino National Forest and its mountain home offer a natural setting just 90 miles east of Los Angeles where you can enjoy fresh air and a myriad of outdoor activities. Popular recreational destinations in the San Bernardino Mountains are Big Bear Lake, Lake Arrowhead and Running Springs, while the San Jacinto Mountains offer Idyllwild and the hiking and rock climbing challenges in nearby Tahquitz. This section would not be complete without some mention of the infamous Route 66, even though the days of folks getting their travel “kicks” there are now history. The Mojave Desert was the most dreaded section of the route and while services are still few and far between, present-day travel through the area is not nearly as harrowing. A couple of Route 66 historical points of interest still exist in San Bernardino: the site of the world’s first McDonald’s (located at 14th Avenue and E Street and now a museum) and the Wigwam Motel near the city’s border with Rialto. The Wigwam recently received major renovations and was the 2005 Cyrus Avery Award recipient for the best preservation project. Individual teepee shaped units are arranged in a small village-like setting and offer a unique lodging opportunity in what many consider southern California’s most famous hotel.